Our vision is to connect every single dentist in the United States. We aim to communicate the strategies & tactics necessary to improve patient treatment by enhancing efficiency, reducing waste, and referring with precision. 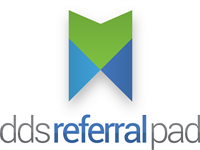 Are Dental Patient Referral Contests Legal? We’re going to shift gears here for a bit and talk about dental patient referrals - as opposed to professional referral networking or relationship marketing. Never mind the ethics; we’ll just examine the legality. Post by Charles River Dental. Now don’t get us wrong here, we’re dentists not attorneys - but with the popularity of dental patient referral contests on Facebook and other social media outlets, we thought a little law review was in order. And let’s not just pigeon-hole referral contests either, review contests seem to be all the rage as well. Check out this video we found on YouTube that touches on the subject - albeit talking about Michigan specifically, laws vary from state to state. For some background nomenclature, we’re quoting Kerry O’Shea Gorgone here - a lawyer & professional marketer. “First, although people often call their giveaway a “contest” or “sweepstakes,” each word actually means something slightly different, from a legal standpoint." You can check out this post & her website for some additional insights on the legality of running social media contests. 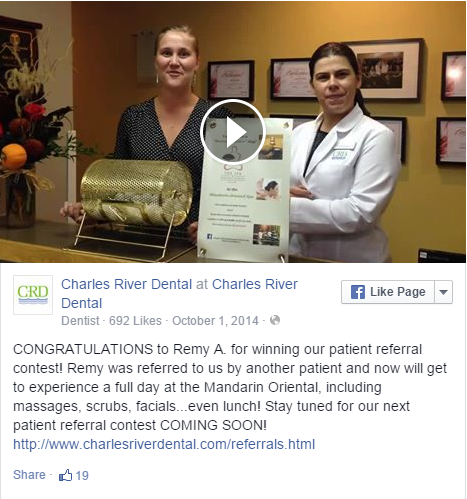 That content was actually the inspiration for this post on dental patient referral contests. 1. Consult an attorney: When in doubt, ask a lawyer. Sure you’ll have to pay for it but it’s better than paying a fine to a state dental board, the FTC, or worse. If you’re running a dental practice you most likely have an attorney. Whether it’s an old college chum on constant (if not compensated) retainer, a professional referral networking partner, or a high-priced firm you employ to CYA on potential malpractice issues, ask them what is legal and what is not when it comes to your dental patient referral contest. Kind of goes without saying, but you’ll want to consult that attorney BEFORE launching into a social media fueled sharing frenzy about your patient referral contest. 2. Run contests, not giveaways or lotteries: Select the winner of your dental patient referral contest based on talent, creativity, humor or some other factor that removes your promotion from the “giveaway” categorization. You don’t want to get caught in a lookalike Medicaid pay to play kickback dental patient generation scheme! 3. The art of a disclaimer: Be sure to include specific statements intended to specify or delimit the scope of rights and obligations that may be exercised and enforced by parties in a legally recognized relationship…i.e. a dental patient referral contest. More attorneyspeak, but seasoned marketing professionals (often times NOT the ones running most dental patient referral contests…) also understand the necessary language to include as disclaimers in order to protect your contest, dental practice culpability and that of its entrants. Use terms such as “Void Where Prohibited” and “No Purchase Necessary” to add some more CYA layers of protection. Don’t know which disclaimers to use? See tip #1. 4. Encourage disclosure: Maybe this has more to do with a sharing, liking, commenting, or guessing type contest more than a dental patient referral contest…BUT, save yourself the potential danger by requiring contest (or giveaway) entrants to mention that the posts they create, the comments they make, or the content they share is part of a promotion, and that they’re posting for a chance to win. “Everyone else is doing it” and “I know you are but what am I” never worked when you were a kid - so don’t try to pull those weak excuses out in defense of your dental-centric social media contest. “When the law comes to town, your nose will be clean, and you’ll have built trust with your audience in the meantime."